Unfortunately, due to the inclement weather on Saturday, sailing was cancelled, so sorry but no pictures available. I did however visit the Birmingham Military Tattoo on the evening and what a fantastic event it was. It's my 4th Year of attendance and I highly recommend it. Sunday was the turn of the Warley MRC Model Railway exhibition at the NEC, Birmingham, Perhaps I should of stopped overnight in Birmingham for once ! Next Saturday, 1st December we have another "Sunset Sail" planned, hopefully the weather will be more favourable to us, "fingers crossed!" 2013 club sailing days - UPDATE. To follow on from comments put forward at the AGM meeting that the Saturday sailing days have had a makeover, so each Saturday has a different "theme" to encourage specific classes of boats out on each weekend. This also reduces the number of boats you will have to carry in the boot of your car, as you know fully in advance "what’s going on and when". I have also included the pub night meets AND the list of events CMBC will be attending [so far]. This "event list" is not yet complete as some clubs are yet to respond with dates, so that’s why you will receive updates, plus we may decide to swap some of the weekends around, just to catch you out and make sure you are checking it ! The list I hope is easy enough to read and understand. This means ANY type of boat, so you will expect fast electric, scale, sail and in-between types on the water. This is purely a general non event type sailing, purely just for fun. What an afternoon this was! Totally different to the weather forecast. The rain missed the area completely and left us with a very mild and sunny afternoon on which to sail. What a pity a lot of our club members followed the weather forecast and stopped indoors, well you missed out on a cracking afternoon sailing. A good few of our hardy sailors turned up, me included, but afraid unable to sail, yep, guess who forgot to put the boats transmitter in his bag? Camera - yes, batteries - yes, bottle of pop - yes, spare batteries for cameras - YES. Transmitter for boat NO !!! Ah well better luck next time. Tunnel hull on a mission ! 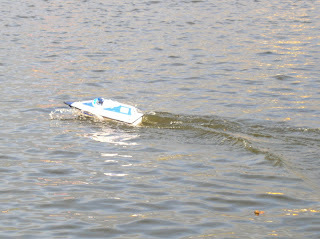 International Model Boat Show 2012.